The disposable leaf plates are made with leaves/sheath of betel-nut tree, a palm family which is a renewable source. Hence no trees are cut for manufacturing these products. The betel-nut trees are grown in hilly areas without any assistance of fertilizers and hence there will not be any trace of pesticides in the leaves. 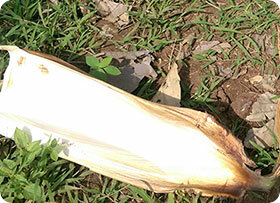 The sheath which primarily protects the betel-nut in the tree falls naturally once it is dried. The fallen leaves are collected fresh from the farm and stored properly. 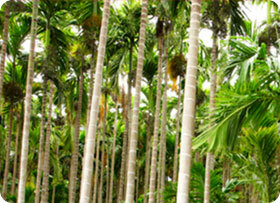 Learn more about the areca leaf plate manufacturing process. The unique properties our products possess in nature cannot be matched to other types of alternative products in the world currently. Our products are 100% Natural, Bio degradable, Compostable, Oven safe, Water resistant and can hold liquids both Hot & Cold, Freezer safe and more importantly do not react with food or liquid when used. Areca leaf products are safe in all Microbiological testing (like Plate count within acceptable limit for food contact, No Presence of E-Coli, and no presence of Fungus). Also the products do not contain any heavy metal and confirmed through laboratory test for each consignment. Additionally our products will pass the Compostable testing. MICROWAVE / OVEN USAGE Can be used to microwave foods. Also safe for oven cooking to certain temp. Not microwave oven safe as the laminate could mix with the food items. Some are microwave safe. Mostly not suitable for oven cooking. Can be used for Microwave, but not for oven cooking Few can be used for microwave, but not oven safe. The Quality of the product is monitored throughout the entire process and ensured that only good products are passing through the final stages and reach the Customer. These tests are carried out in order to access the presence of fungus, E.coli, and assessment of plate count. The results show the Areca leaf products have no presence of E.coli and clean from any other micro-organisms and safe for food contact. These tests are carried out in order to find the presence of metals like Iron, Lead, Copper, Zinc, and Aluminium Phosphide. The results show the heavy metal presence is below detectable level and safe for food contact. The above testing will prove the Areca leaf product is completely biodegradable and Compostable in nature.